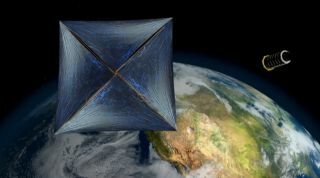 This artist's illustration shows a sail-equipped nanocraft that Breakthrough Starshot team members hope to send to other star systems. The group outlined the technologies it needs to develop and test, none of which are particularly exotic. For example, electronics and lasers have both gotten consistently smaller and cheaper over the years, and the computing power of space probes launched decades ago now fits into an iPhone case, team members said. Space sails, which use the pressure of sunlight (or, in this case, laser light) for propulsion, have been demonstrated off Earth multiple times, and work continues to make them more feasible. And the physics of laser propulsion have been understood for nearly a century. So making Starshot happen doesn't depend on a huge technological leap, such as would be required to make fusion power feasible. But the project still faces significant challenges, said Jonathan McDowell, a scientist at the Harvard-Smithsonian Center for Astrophysics in Cambridge, Massachusetts, who isn't involved in Starshot. The powerful laser presents one potential problem, McDowell said. "You're pumping a lot of energy into this object," he told Space.com, referring to the Starshot nanocraft. "You'd better hope 99.9 percent of it gets reflected." Then there's the interstellar medium. Space isn't completely empty, and moving a spacecraft, even a tiny one, through the interstellar and interplanetary medium at a sizable fraction of light speed has never been done. "The interstellar medium isn't zero," McDowell said, meaning that the probes might hit something. The Starshot probes would be traveling 4,000 times faster than NASA's New Horizons Pluto spacecraft, which is the fastest thing that humans have launched to date. At such speeds, colliding with even the smallest bits of matter could be disastrous. "A hydrogen atom moving that fast is a cosmic ray," McDowell said, referring to superenergetic particles accelerated to tremendous speeds by supernova explosions. "Electronics don't like that." Even spacecraft shielded against cosmic rays can still be damaged by them, as happened to NASA's Dawn spacecraft in 2014 during its journey to the dwarf planet Ceres. Furthermore, a particle the size of a sand grain would deliver the same energy to a Starshot probe as a pound (0.5 kilograms) of TNT, potentially destroying the tiny spacecraft entirely, McDowell said. During the Tuesday presentation, Worden said this problem is mitigated by the sheer size and relative emptiness of space, which makes the odds relatively small that the probes will hit anything. In addition, hundreds or thousands of Starshot probes would probably be launched to each interstellar destination, so losing a few wouldn't be a big deal, team members said. Finally, there are the challenges posed by building a laser big and powerful enough to push the spacecraft to such tremendous speeds. The laser would be a type called a phased array, which involves using lots of lasing elements to create a single combined beam that can be steered without needing a huge mechanical apparatus. The various elements can also be fired to shape the emitted light waves the laser emits. The technique is common in radar systems, said Starshot advisor Philip Lubin, a physics professor at the University of California, Santa Barbara, who has researched building large laser systems. "We can learn a lot from that," Lubin said of such prior research. But he acknowledged that nobody has built a phased-array laser on a Starshot-level scale before. Lubin said the Starshot array would be composed of thousands of meter-sized (3.3 feet) optical elements and would cover an area approaching several square miles. It would require on the order of 200 gigawatts to operate. That's 50 times the power generated by the largest nuclear plant in the United States. However, the laser wouldn't be firing continuously, and would probably run off some kind of power storage such as a huge capacitor or battery, firing for only a fraction of the time, Starshot team members said. So the power for any given use could be cut to 20 GW, Starshot team members said on Tuesday. A phased array is attractive because going with a traditional laser would require a single massive optical system, Lubin said. "That's much more horrendous to do," he said. There are other issues related to the laser, too. One is that the plan calls for building the laser on the ground rather than in space. That means that the beam will ionize the air around it, which could interfere with the beam itself and create massive amounts of ozone, McDowell said. "The environmental-impact statement will be interesting," he said. Another issue is Earth-orbiting satellites, many of which can't be steered and might get in the way of the laser beam. They might therefore be damaged, or create interference, McDowell said. But this isn't necessarily an insoluble problem. "Maybe there's a way to time it," McDowell said, referring to the firing of the laser. Despite such challenges, McDowell said he and other scientists are taking the Starshot idea seriously, and that's why they engage and try to see where the flaws are. "When physicists start to pick it apart, it's a way we show the love," he said.